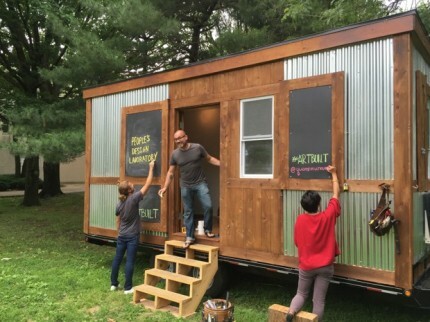 ArtBuilt Mobile Studios are small mobile workspaces that let artists, social-service providers and micro-businesses work in new ways and in new places. ArtBuilt is a collaborative partnership between ArtBuilding and ArtHome, two non-profit organizations which work to support the creative sector by helping individual creative workers. Skyrocketing studio rental costs is the biggest challenge facing New York City’s creative sector, according to the Center for Urban Future’s Creative New York Report released in June 2015. In the ten neighborhoods most closely associated with art and creativity, rents rose by at least 32 percent from 2000 to 2012. This summer, ArtBuilt Mobile Studios demonstrated one potential solution to the crisis at the Queens Museum, where two artists participated residencies in the mobile studio. Built at an extremely low price-point, the 8.5 X 19.5 studio on wheels showcases how artists that might never qualify for a commercial lease or even a home loan could potentially own their own workspace for as little as $13,000. It can run on grid power, biodiesel, or solar, and its ultra-efficient heating and cooling systems are integrated.